– Matt Hagan maybe suffering a bit of post-championship hangover. Hagan, who won the 2011 Funny Car championship for Don Schumacher Racing, lost in the first round of eliminations and finished 12th in the season-opening Winternationals a week ago. He didn’t wow ’em in qualifying, either. At Firebird, Hagan again came up dry in eliminations, losing in the first round to unheralded Todd Lesenko. A couple hours later, Hagan headed out of Arizona outside of the top 10 in points. Temperatures were a little cooler on Sunday morning during the opening round of eliminations, which might have thrown Hagan and crew a curveball, he said. “The track was a little bit better than we thought it was,” Hagan said. “It basically went out there and shook the tires. I pedaled it and it dropped two cylinders, so it was laboring out there. I never saw Todd (Lesenko, opponent). I guess we were pretty close together all the way down the track. 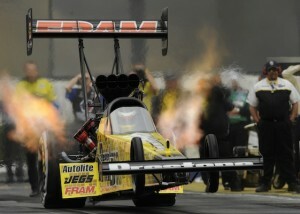 The NHRA series takes a couple-week break before returning to work for the Gatornationals on March 8. Hagan plans to head back to his cattle farm in Virginia. On the way out the door in Arizona, Hagan was philosophical. “I’ll head home and get back to work and regroup and be ready for the next one,” Hagan said. “My guys shouldn’t hang their heads and I hope they go back and put this behind them as well. “That’s racing. There’s a winner and there’s a loser. We will go to Gainesville and dig deep. 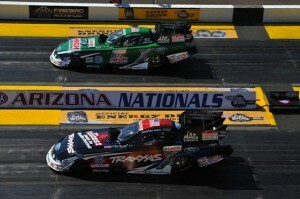 of Funny Car eliminations on Sunday and was soundly beaten. The loss was not the result of taking a loving dive, the 15-time champion said. It was the result of a poor performance on his part. Force also said that his daughter may have gotten into his head. “Yesterday (in qualifying) she had flickered the light on me and in the next session I flickered the light on her,” Force said. “I don’t do it to screw her up. If I screw her up and hurt her as a driver then I could have sponsor problems. I don’t want to screw her up. When I did it I wanted her to see what it was like. I’ll be honest it distracted me a little bit in the first session yesterday. Courtney Force went on to win in the second round Sunday but lost in the semifinals to teammate Robert Hight. Hight went on to win the event. they looked merely very good as they lost in the second round to eventual-winner and teammate, Antron Brown. “It’s tough racing your teammates in the second round,” Massey said. “DSR has the best equipment and the best cars out here, so you know when you race one of our cars, it’s going to be a battle. With temperatures warming up for the second round of eliminations, the crew chief duo Phil Shuler and Todd Okuhara needed to pull the reins in on the Prestone/FRAM dragster. 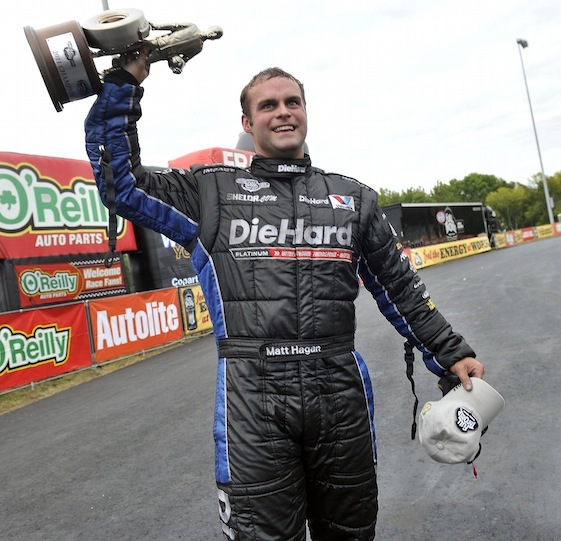 “We knew that Antron was going to run very well,” Massey said. “We tried backing the car up a little bit because the track was getting hotter but this Prestone/FRAM dragster wants to go fast. – With a weekend of experience in its pocket, the Al-Anabi Silver team of Shawn Langdon showed it may be ready to take its place at the top of the Top Fuel class. Langdon, who moved to two-time champion Al-Anabi in the off-season, followed up his second-round loss at Pomona with a No. 1 qualifying run and made it to the semifinals before losing to eventual event winner Antron Brown on Sunday. “Our Al-Anabi car was great this weekend,” Langdon said. “Right out of the box, we qualified No. 1 and really thought we had a good shot to win the race. We knew Antron would make a good run in the semifinals, and we felt pretty confident in what we wanted to do. For whatever reason, we were just a little too aggressive, and it didn’t make it. That’s how it goes; it’s part of drag racing. – The dark horse field in Pro Stock consists, basically, of every team not owned by Ken Black. Greg Stanfield showed signs of being added to the list. Stanfield was the No. 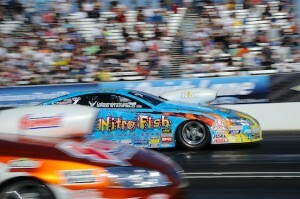 14 qualifier in the Coffman Tank Trucks/Nitro Fish GXP. In the first two rounds he earned victories before his day was ended by KB Summit Racing’s Jason Line, the eventual race-winner. “I didn’t expect to win any rounds Sunday,” Stanfield said, “but it turned out to be a good points day.” The effort did lift him into seventh place with 103 points. Stanfield began the day by upsetting No. 3 qualifier Ronnie Humphreys in the opening round. He had a .038-second reaction to a .070 that led to a 6.623-second quarter-mile run at 209.20 mph to a 6.592 at 210.93. His easiest race came against Larry Morgan. A near-perfect .001-second leave provided a big edge, and Morgan had problems and slowed to an 11.038 to a 6.636 at 207.85. He added a .029-second reaction against Line (to a .054), but Stanfield’s 6.618 couldn’t off Line’s 6.556. – Vincent Nobile, the youngster who popped eyeballs as a rookie in 2011, returned to Arizona hoping to become a repeat winner. However, a red-light start in the second round of eliminations ended the hopes. Despite the early loss, the Nick Mitsos-led Mountain View team did come away with some positive signs. They appear to have fixed the clutch problem that plagued the team at times over the last year. During qualifying, Nobile drove to a 6.549 elapsed time, which was good for the No. 4 spot, matching his best career qualifying performance. After a solid win against Shane Gray in round one, Nobile was paired with four-time world champion Greg Anderson in the quarterfinals and that’s when the ugly red-light appeared on his side of the Christmas Tree.